My Garden Exchange made it safely to Nathalie in France. I was a bit nervous as this was the first time I had ever sent something overseas. It made it right on day 7:) Here is my first attempt at both a flat fold and cording. Not to toot my own horn, but I think I did a good job. I had to wrestle this out of Allen’s hands. 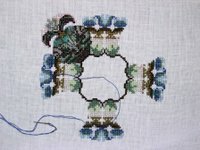 I got this pattern from Helen Phillip’s Garden book. 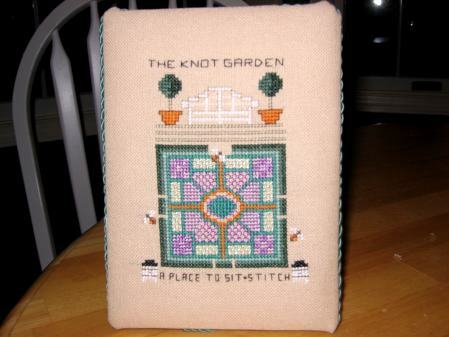 I changed the wording a bit to make it relate more to the fact that I was doing it for a stitching exchange. Friday, I finally started working on Butterfly at Rest. I began with the giant blue triangle on the bottom left. 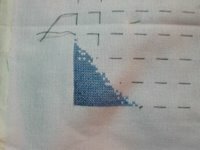 While stitching on Butterfly Dawn, Allen dubbed these triangles the “big blue triangles of doom” These triangles were the main reason why that piece took me 18 months to finish. I was not doing a rotation then and I would get so tired of them that I would put it away for a long time. 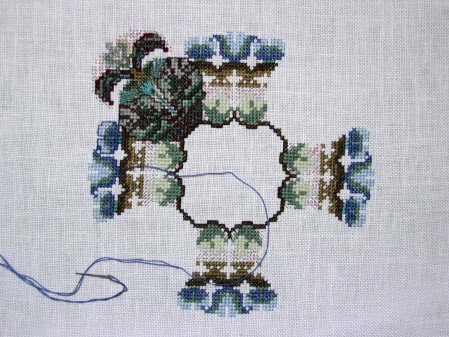 Currently, I am itching to get back to this on Friday and hope to finish the first triangle. Congratulations, Leslie 🙂 You did a great job 🙂 You go girl! Ack! I have to get my BAR started too. Beautiful finish on the garden exchange! 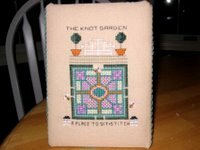 Great job on your garden exchange piece, Leslie! Awesome finishing! 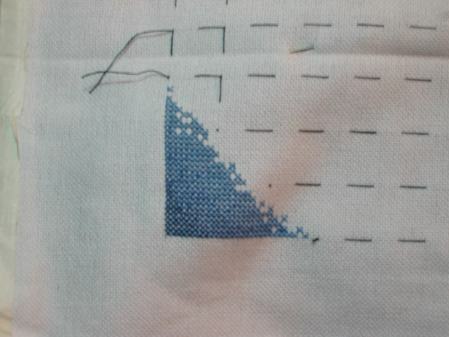 Oh, you are a brave soul to start with those blue triangles on Butterfly at Rest LOL!! Braver than I am, that is for sure! And, last but certainly not least, woohoo, awesome progress there on Mystery IX!! Keep going!! I hope Part 2 in February is a little less intense 🙂 No guarantees with Martina, though! Hi,what a lovely flat fold, well done, a great finish. The garden exchange piece looks fantastic! The design is beautiful and you have done a great job with finishing. Your stitching looks great! 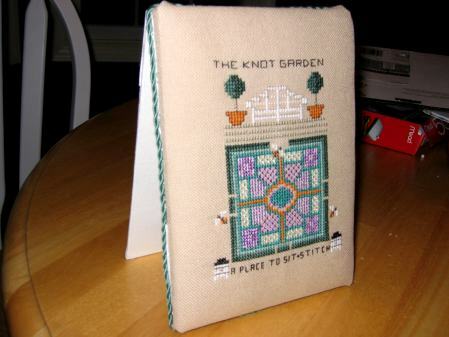 You should be proud of your finishing on the garden exchange piece. I’m sure your partner loved it. What’s up with the weather in the DC area this year? I’m in Reston, and it has been a *strange* January. I love your flat fold – it’s a fun finish to do isn’t it? Everything is looking lovely – looking forward to seeing part I of the mystery complete.